The Village Haberdashery, West Hampstead – a huge treasure trove of all things crafty – from fabric, to yarn, to buttons, to books, just about everything you could need, in a large, bright, airy, modern room. And I’m teaching beginners’ crochet here twice a month too. Fringe, Muswell Hill – 10 minutes’ walk from Alexandra Palace, this lovely shop has yarn and accessories, books and kits, plus lots of beautiful craft pieces by local folk to buy. Loop, Angel – a delight on two floors, this shop has lots of special sumptuous yarn, plus loads of books, and you may find someone spinning upstairs, or knitting on the sofa. Wild & Woolly – a sweet, compact shop in Hackney that’s full of gorgeous yarn, some even hand dyed locally. Lots of accessories and books and patterns too. Nest, Crouch End – a little hidden jewel, with lots of yarn, and books, plus plenty of room for sewing lessons among other classes. Just some of the places I teach crochet and knitting, or just drop in for a coffee and a bite to eat. The Arthouse, Crouch End – a fantastic independent cinema, which has knowledgeable, friendly staff. It shows a mixture of blockbusters and art films and documentaries on its two screens, and always has local art on display in the cafe/bar. And best of all, it’s a great place for knitting and crochet classes. The Haberdashery, Crouch End – a sweet place to sit and stitch, it has a garden, and has art displays from local artists that change every month too. Edith’s House, Crouch End – a delightful little cafe where each table is a separate retro ‘room’, all based on the owner’s nan’s house. They even have a bag of knitting you can dip into to do a few rows, plus a resident dog. And I designed some of their tea cosies, which you can read about here. Elsie’s Cafe, Hornsey – a lovely cafe with outdoor tables at the front. It’s always welcoming and is a great place to teach knitting and crochet. It’s dog-friendly too, and is just a door away from our local vet’s! Attic24 – always lots of colourful inspiration, with flowers and blankets to the fore. Gabberdashery – I met the lovely singer Gabby Young ages ago when I was a music journalist, and I love her blog, which often includes videos, with news of her latest sewing exploits. Freddie Patmore – I used to work for the same magazine company as Freddie and we often spent Friday lunchtimes knitting together with like-minded crafters. Freddie’s blog has allsorts, from interesting techniques to her photography, to her jewellery designs – always worth a look. Knitmore Girls Podcast, Keep Calm & Carry Yarn and Curious Handmade, are just three of the knitting and crochet podcasts I regularly dip into, and Nathan Taylor the Sockmatician is always a good watch on Youtube. There are so many to choose from! Ravelry – not a podcast or a blog, but this social media site for knitters and crocheters is a wonderful place to connect with fellow crafters and share and purchase patterns, post updates about your completed projects and work in progress, log your stash of yarn and much much more. Knitting Magazine – a monthly treat, especially for the more experienced knitter. 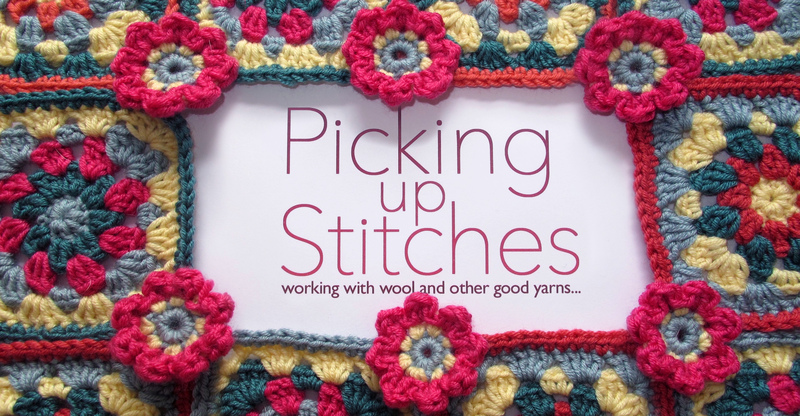 Womans Weekly Knitting and Crochet magazine – a really accessible, beautifully presented monthly, it has fantastic knits and crochet projects for everyone from beginner to more experienced crafter. Simply Crochet – this magazine always has something quirky to make, as well as info about interesting stitches and techniques.